Saw this on Twitter yesterday and followed you. I had lots of fun playing this last night. The bosses are TOUGH. I wish they had just slightly less HP. They have so much that the fight just feels drawn out. I also can't get used to pressing down twice to go through platforms. Can you change it to down and jump? The controls are very responsive. I don't feel any lag whatsoever. Bullets are nice and bright so I can actually split my attention to other areas of the screen. All in all, this is really fun. You have a good project on your hands! Thanks for playing! Glad you had fun with it. I'll redesign the bosses eventually once I get all the main content finished, they're rushed and inconsistent now. The platform jump thing has been changed, added a dedicated crouch button too which will be there next demo. Niiice, yeah I can't wait! The video I saw on Twitter was for Level 4. Seriously great idea mashing up shmup with platforming! Yeah getting close to the end now since it's gonna be a standard 5 levels. And thanks, it's the style of gameplay I love myself when I can find it. Sadly it's so rare I had to resort to gamedev myself. I wouldn't say sad. I mean, you ARE making the game you want to play, right? Nothing sad about that at all. I'm joking, I do enjoy making it a lot. Just wish there were more games in a similar vein as a fan of both genres, is all. Really enjoyable demo. I was surprised by how well the jumping physics are suited for dealing with the barrage of projectiles enemies shoot at you. There's some lack of polish and visuals might be somewhat underwhelming, but they create a cohesive whole and shooting stuff just feels good - explosions are on point and enemy fire is easy to see. As others said, an autofire button would make a great addition - the frequency of mashing gets pretty hard on you after a while. I felt the charged fire of blue/red weapons isn't very useful - it has quite limited range and most of the time it seems to be just faster to kill things with ordinary fire. I think I saw it had some bullet-blocking properties, but it appears to be very situational, maybe I just didn't get used to it well enough. I'd also probably find myself using boost more often if it was possible to initiate it without right/left input. It's nice that there is an option for basic key rebinds, but I wish gamepad support was a little more robust - it seems like only pad 1 can be used. I'm looking forward to more news about this game. This was really really good, very juicy visuals and gave a good "feel" when playing it. This tidbit won't help you in development but I am heartbroken to find from these comment out the boss that kept killing me was apparently just the midboss. Enjoyed it, liked the voices for the pickups. 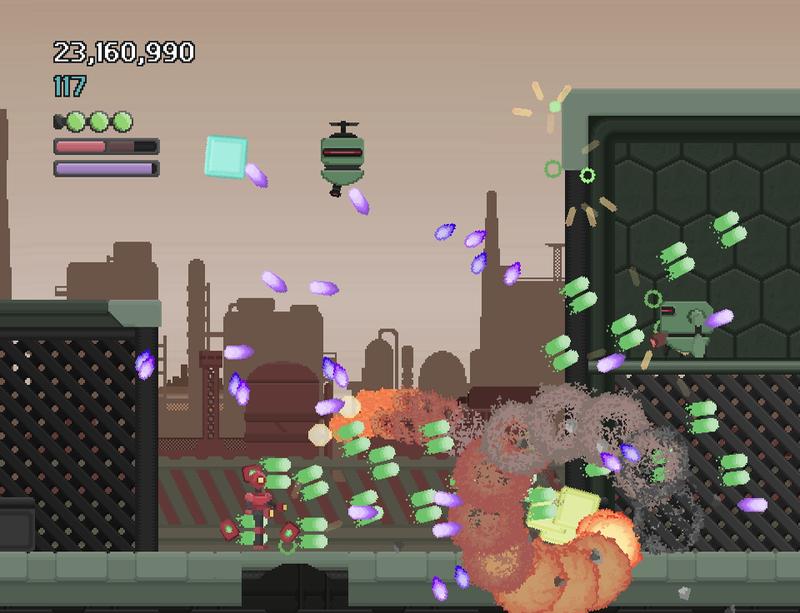 I am not very good with games that have a lot of bullets however and was unable to beat the actual boss[?]. I expected the D-Pad to work but only the control stick works it looks like. What does the fuel do? It reminds me a lot of Contra: Hardcorps wich says a lot of good things about your game. I think having checkpoints at least on the easy difficulty wouldn't hurt too much. Gameplay is excellent and the graphics are nice but also have room for improvement. I'm already waiting for the next demo! Great Job! Thanks for playing! I'll likely add checkpoints at some point, planning a "story mode" of sorts in addition to arcade mode anyway. Art is definitely my biggest weakness. A story mode sounds great. And don't worry, art is the kind of stuff you never stop learning about. Again, Loved the demo and hope to see more of this game soon! I'll try my best senpai! This is a really rad Contra kind of game, super fun, no complaints here. Pretty great contra / robocop clone. Might want to add continues, but it's pretty solid! That was pretty cool, i had to figure out controls, but once i did, it got good. Everything looks floaty, but controls really tight, which is good. I guess this is kind of a shmup/platformer mashup, which i've found pretty nice. Props for making EASY actually easier, so old men like me could get to the end. Get some snazzy graphics, and you're golden, the controls are tight, and the game is basically all there. It might feel better with a controller with a twin-stick setup, but i'm not sure. Also, having to mash the button for a continuos fire and such a short timer on button hold is frustrating. Thanks for the feedback, man. Autofire is on my to-do list, so that'll be taken care of. Snazzy graphics is the ultimate challenge. What do you mean by short timer? As in it doesn't shoot enough projectiles per button press? I mean that when you mash fire, sometimes it'll start charging up, even though it wan't your intention. Like the threshold that separates regular fire and charging up is too small.